What inspired you to give cycling a go? I’ve cycled to work for about eight years now, having used the bus when I first started working at the University. A friend kept telling me to give it a go and one day I decided to try it for a week and see how I felt. It felt great, so much easier and quicker than public transport so I never went back to the bus. What do you enjoy about cycling to work? I find it much more convenient than a car or public transport. I can set off at whatever time I like and my journey time is not affected by the rush hour traffic. I have found a route to work that avoids busy roads so is very relaxing. It’s a chance to ease myself into the day and de-stress after work. I wouldn’t have it any other way I love cycling and the freedom it gives me. 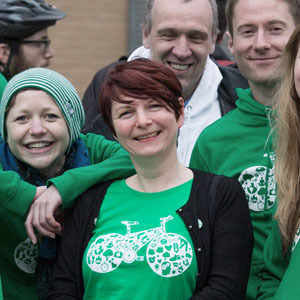 What would you say to other people thinking of giving cycling a go? Just try it for a day or a week. Check out a route into work and choose roads parallel to the main bus or car route. If you want some company or help with a good route into work use the Buddy Scheme.